I am a healer who offers vibrational energy attunements. But it wasn't until I had a healing crisis of my own that I experienced the best of what vibrational energy treatments can do for a person. One of the most important parts of maintaining my physical, spiritual and emotional well being is enjoying a monthly vibrational energy attunement. Many years ago when I first started working with energy fields, I thought that energy treatments were just for healing physical or emotional problems. Of course, the treatments did assist in shifting energies for healing physical ailments. But as time went by, I discovered that vibrational attunements, when done on an ongoing basis can do much more. Some of you may not be familiar with what a vibrational energy treatment is. It is simply any treatment that moves the energy in your aura for the positive, so that healing, wellness, centeredness and expansion can be realized. A hallmark of a vibrational energy attunement is that one feels lighter, more balanced, centered and energized with little or no down side. You might feel pleasantly light headed (or out of body); if you've moved a lot of energy during a session, you might experience diarrhea within 24 hours, but that should stop naturally as your blocked energy clears. 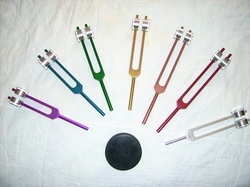 There are many, many different types of vibrational treatments: Reike, healing touch or healing hands, tuning forks, crystal therapy, aroma therapy, flower essences, color and sound therapy and the like. Therapies such as: massage, cranial sacral therapy, acupuncture, acupressure, reflexology and yoga also move energy in similar ways but these are performed directly on the physical body with contact - whereas the previous therapies either do not touch the body at all or do so with just minimal touch. I personally enjoy the most non-invasive therapies to the physical body, as these therapies are most easily tolerated and rarely have negative side affects. These therapies tend to be gentler than those that maintain contact with the physical body. I am especially sensitive and have had problems (extreme pain and bruising) with massage and even reflexology from time to time. But many people really enjoy and benefit more from the physical therapies, like massage, and some types of yoga. There are so many types of energy treatments available now in most markets; it’s really fun to explore those that you are drawn to. I have said before that when I was working on deep grief issues, western medicine had little to offer me. It was through holistic treatments and especially vibrational energy treatments where huge levels of lightening occurred for me dispelling grief, depression and fear of the future. No, I was not "cured" in one or two sessions, but as I did address and release my stored emotions with vibrational energy attunements, I was able to naturally walk into a healthy state of being. As I made progress, my western doctors who I still see annually for checkups would comment on how generally healthy I was considering the extent of my losses. They would ask what was I doing and I would say: “I am aware of and enjoy my direct connection with God; I take quality vitamins, have regular vibrational energy attunements and enjoy many wonderful friendships.” The doctors would respond, "Oh, well good... ah, keep doing that." When I began to have "wellness" energy treatments - there were no special or specific problems to address. It was then that my treatments became even more profound for me. During the wellness sessions was when deep adjustments to my aura occurred. I received amazing downloads and went to new levels of beingness. As with meditation, I often received direct access to information from my guides and ascended masters during sessions. I found that when I received adjustments during wellness sessions, I was easily able to integrate the changes that occurred during the session and achieved higher states of integration, then when I had a session to stop pain - whether it was physical or emotional pain. When the first of a new month comes up, the first thing I do is rejoice, knowing it's time to set a new energy appointment. It's not something that I have to do, and I am at the point in my life where I could get by without it. But I want to be all that I can be, to enjoy my life to the fullest and have my highest connection to Spirit. So I thank God for connecting me to a network of wonderful healers. By the way, I’ve just booked my next vibrational energy session, why don’t you treat yourself and make an appointment today with your favorite holistic healer– you deserve it! To book your healing session with Reverend Barb, click here.